OVERALL SALES PRICE REDUCED $251,000!! WHAT A DEAL!! Exquisite Custom Estate in the highly desirable gated Vista Del Corazon Subdivision W/Mesmerizing views of Superstition Mountain & backs to full views of the 12th hole of Dinosaur Mtn Golf Course. Recent exterior upgrades include new front paver driveway, stone veneer trim, new exterior paint & new coated roof system under a huge Solar powered electrical system. Owners recently installed over $100K of new floor to ceiling Cantera stone & trim, including a custom Cantera fireplace mantle at the entertainment center walls which wrap around to a peaceful interior floor to ceiling water fall feature. Canterra Stone wrapped pillars at the formal dining room & all niches in the hallways. (Click More Tab for plenty of other details) Fabulous Custom Cantera Stone range hood over the glass cook top W/Travertine backsplash & plenty of Alder cabinets. Kitchen boasts SS appliances, granite counter tops & kitchen island with new Cantera Stone wrapped around the front W/custom light fixtures. Now for the VIEWS! Enjoy the fabulous Superstition Mountain & Golf Course views from the huge Great Room which leads thru a HUGE electric operated, concealed Arcadia door which leads to the dual heated Negative Edge pool W/Custom water fall features including a custom overhead Rain Shower water feature from the upper Deck onto the pool steps. There are 3 patios consisting of the upper level extended covered patio which wraps around to the kitchen entry/exit door for easy outdoor entertaining including slate tile floor & custom pull down sun shades for privacy. Step off this patio to outdoor patio #2 W/Custom pavers where you can enjoy the relaxing late afternoon sun while it casts ever changing shadows onto the Superstition Mountains & then the city light views as dusk leads into evening or step down to lower level patio #3 and enjoy an evening fire at the Natural burning, stone faced fireplace as the Superstition Mountains & golf course views in the background fade into the evening. This home is AMAZING! Now let's step inside for the remainder of the interior features! There is a built-in, wine cooler room behind the formal dining room where you can store your wine collection with nearly 100 slots including a small bar. Dinnerware is stored in the custom cabinets at the inset in the Formal Dining room including a granite counter food serving area. 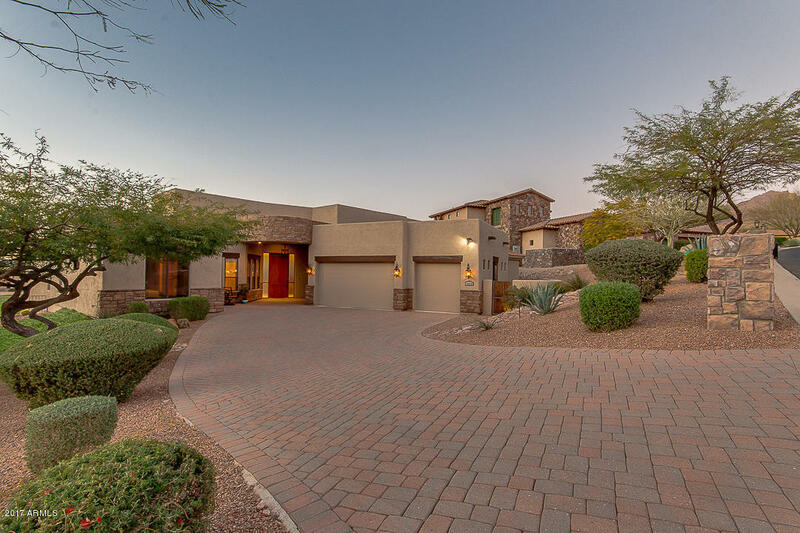 Onto the huge Master Suite where highly upgraded carpet flooring greets you along with Huge windows that over look the Golf Course and Superstition Mountain & a separate entry/exit door leading directly to the pool & covered patio W/Custom wood blinds for privacy. Step into the large Master Bath W/Dual Travertine counter topped staggered vanities, jet tub & Snail walk-in shower with Travertine walls & Custom full body & shower heads. Huge master closet has connections for a stackable washer/dryer and plenty of space and storage. The 3 remaining bedrooms are large with tall ceilings, upgraded carpeting and 2-tone paint. A Jack-N-Jill guest bath is shared between bedrooms 3 & 4 which has dual Travertine top vanities with raised sinks and custom fixtures. Below is a huge walk-out basement that can be used as a 5th bedroom, game or play room and has its own 1/2 bath. To the North side of the home on top of the Kitchen/Great room there is a deck for open viewing of Vista Del Corazon, Dinosaur Golf course and fantastic views of the Superstition Mountains and city lights. This home has everything you could want in a custom one-of-a-kind Estate in Gold Canyon.